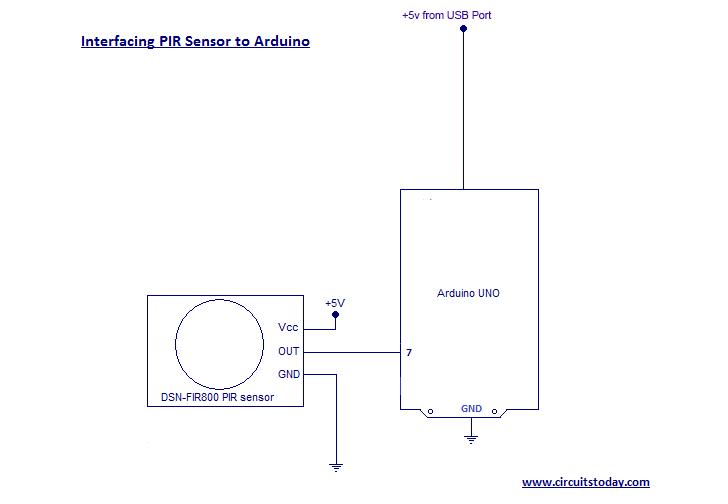 I hope you have got an idea behind the operating principle of PIR Sensor! 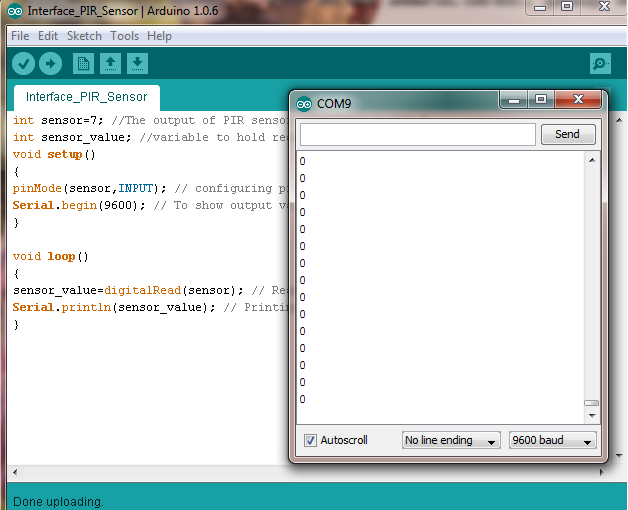 Lets get to our job of interfacing PIR sensor to Arduino! Assemble the circuit as shown in diagram given below. A PIR sensor module has only 3 pins – one is Vcc which is a +5 volts input, a ground pin and finally the digital output pin. Connect +5V from Arduino to Vcc of PIR sensor module, connect a GND from Arduino to ground of PIR sensor and finally connect the output pin (marked as ‘out’) to any digital pin of arduino. In our circuit diagram, we have connected it to pin 7 of arduino. The PIR sensor module has got only one digital output mode. So it has only 2 possible output values – either a HIGH or a LOW. Â By default standards, when there is no object inside the range of PIR sensor it outputs a LOW value or 0V at output. 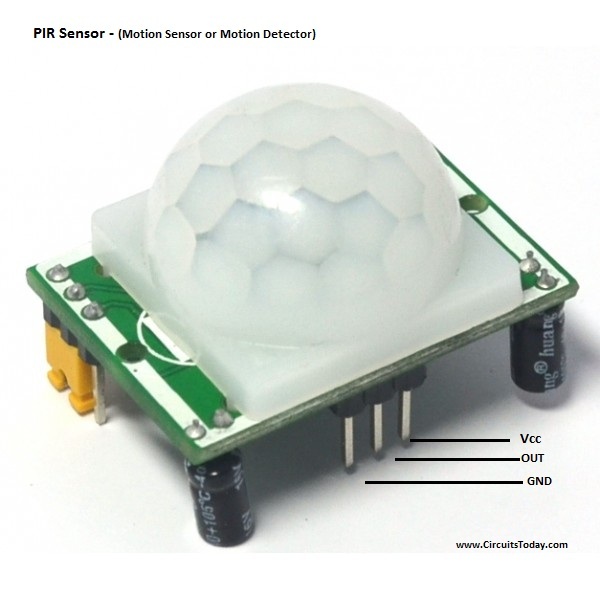 When an object is identified inside the range of PIR sensor it immediately outputs a HIGH value or +5V at output. 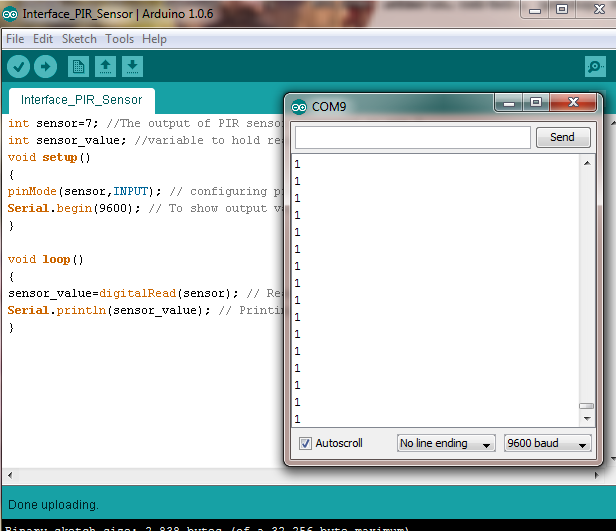 The program and code to interface PIR sensor and arduino is as given below! If you find any difficulty in grasping the code, try reading our other interfacing articles to gain more insights! The program is self explanatory through comments! If you have any doubts regarding, this please ask in comments section. The output screenshots are added below! If you would like to learn more about Arduino and interfacing other interesting devices like RFID module, GSM Module, Gas sensor and many other sensors – read the following tutorials! 1. Interfacing GSM Module to Arduino – tutorial on how to connect GSM module to Arduino and hence send and receive sms! 2. Interfacing RFID Reader to Arduino – tutorial on how to connect RFID reader to Arduino and read RFID cards serially using arduino. 3. Interfacing Gas Sensor MQ2 to Arduino and LPG sensor MQ5 to Arduino – tutorials on interfacing different gas sensors to Arduino! My PIR Sensor is always showing 0 in serial monitor. I tested the sensor giving an LED as the output and the LED blinks everytime the PIR Sensor detects something.Please help……….